In this article we will discuss the “Wedge” Patrol Formation. 1. The Wedge: Is used in open terrain and crossing large danger areas. It is hard to control in dense brush and is slower than the “Column Formation” it that type of environment. 4. The best circumstances for using the Wedge is when/where there is little cover/concealment – i.e. large open danger areas. The second movement technique for the “Wedge” is called the “Bounding Overwatch” technique. This is where the team splits into two smaller teams, and while one team (Team A for example) is providing cover, the other team (Team B) moves forward a distance. Then Team A gets down and provides cover so Team B can move forward. Some refer to this technique as the “Leap Frog” technique. The reason the team splits into two small ‘sub-teams’ is in case contact is made with the enemy. 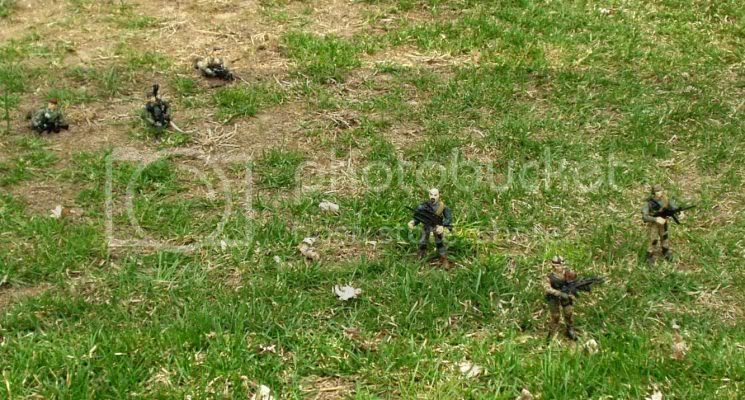 Being split into two smaller teams give one team the chance to NOT be in contact – so they can then aid/provide cover fire so the team that is engaged can then break contact – or if the situation warrants – the second team can begin to maneuver against the enemy while the first team provides cover fire. In this picture A team is providing cover for B team. 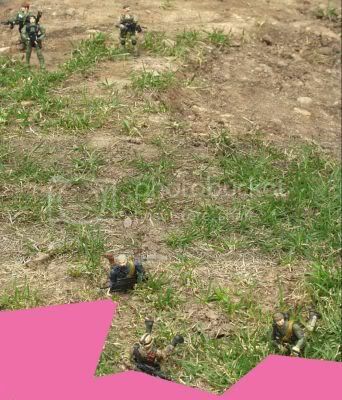 Here we see that B team has moved forward to their next point to provide cover for A team. B team providing cover for A team. A team has moved forward and is ready to get down and provide cover for B team. Note that each man has his own Area of Responsibility (AoR). The distance between men in each sub-team is dependant upon terrain, weather, lighting conditions, etc. – but you want to be close enough so that team members don’t wander in the wrong direction. Bounding Overwatch is the SAFEST way to get a team across a Large Open Danger Area. It is superior to the Column formation because it provides much better firepower to the front, plus full time security. However – it is not as “fast” as the “Traveling Overwatch” method we will discussed previously. In fact it will take twice as long to cover the same amount of distance – but it has MUCH better security. 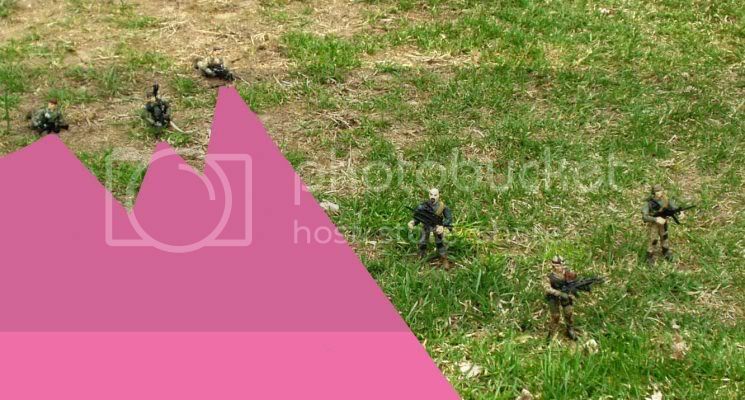 Bottom line – the Bounding Overwatch method is used when the chance of enemy contact is high. One of the biggest weaknesses of the Bounding Overwatch technique - is that is can fatigue a team QUICKLY - especially is the team is carrying heavy loads. Going prone, then getting back up repeatedly can really tax your men - so be aware of this - as the more tired they get - the less they will be able to be alert. There is really no getting around this fact - but is it something you must be aware of. The distance each team moves prior to providing cover for the other team is dependant upon METT-T. An example would be night movement versus day movement. Obviously at night each team would have to stay closer than if it were daytime when visibility is greater. Here is a illustration of the Sectors of Fire (SoF) for the Traveling Overwatch method. Note in this picture - Team A (which is providing cover for Team B) has very good firepower to the front and pretty good firepower to the flanks. In this next shot - notice how the man on the left of A team has had to shift his SoF as B team moves to their next position. Now it is B team's job to provide cover for A team. Note B team has very good firepower to the front - and pretty good firepower to the flanks. This shot show A team approaching thier next position. 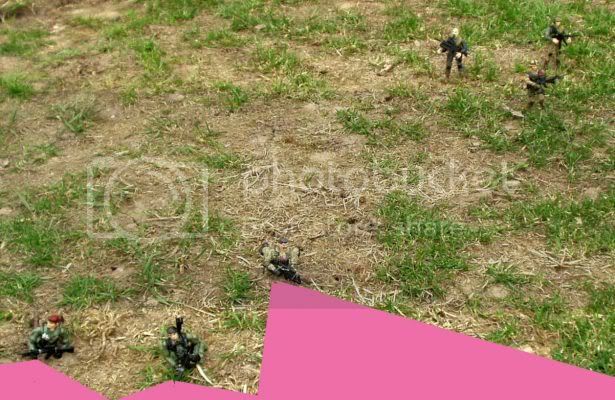 Note how the man from B team has had to adjust his SoF as A team moves down the field. Care must be taken so that teams – while moving – do not go in front of the covering team – thus negating any security the covering team could provide. Usually the PM of each “sub-team” is the TL or ATL so that order/distance/interval is maintained. WHILE providing cover for the moving team, the covering team is also identifying their next point of movement - i.e. where they will move to next. 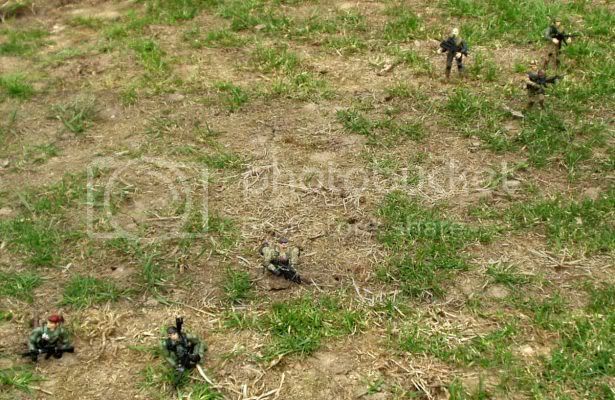 It can be something as grand as some rocks to hide behind/provide cover, or as simple as some pieces of 'micro-terrain' - small depressions in the ground or even small clumps of grass, etc. 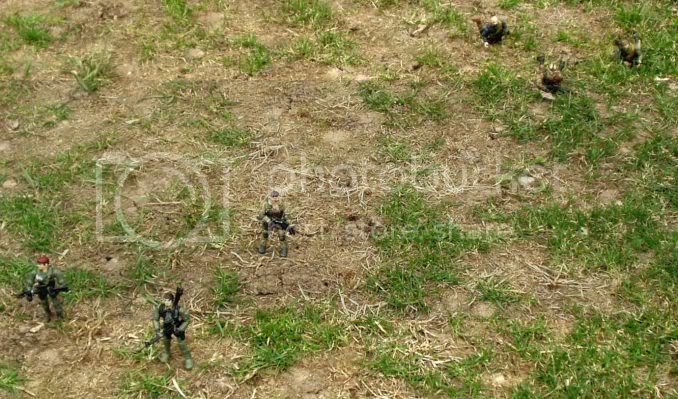 Using this technique – a team is able to cross a Large Open Danger Area that has high chance of enemy contact – with a high degree of security.